Thyroxine Replacement Hormone has been changed to Levothyroxine Replacement Hormone. Please read the Aspen letter for further information. As of 2017, Australia now has three brands of Levothyroxine replacement hormone available for prescription. This brand is available on PBS. Prescriptions can be written in the name of Oroxine or Levothyroxine for this brand to be dispensed by the pharmacist. The ATF Medication Travel Pack (MTP), to be used whilst travelling with Oroxine, is available to ATF Members to purchase. This brand is available on PBS. Prescriptions can be written in the name of Eutroxsig or Levothyroxine for this brand to be dispensed by the pharmacist. The ATF Medication Travel Pack (MTP), to be used whilst travelling with Eutroxsig, is available to ATF Members to purchase. This brand is not available on PBS. Prescriptions must be written in the name of Eltroxin for this brand to be dispensed by the pharmacist. This brand has 10% less active ingredient than the same dose of Oroxine and Eutroxsig. If you are changing brands to Eltroxin from Oroxine or Eutroxsig, your dose may need to be adjusted to accommodate the difference. Levothyroxine (Oroxine/Eutroxsig/Eltroxin) is prescribed for patients who have had surgical removal of their thyroid, either a total or hemi thyroidectomy or who suffer from hypothyroidism/underactive thyroid gland. Levothyroxine can also be prescribed for patients after RAI Treatment. Oroxine/Eutroxsig/Eltroxin are synthetic forms of the hormone Levothyroxine (T4). These Australian brands are the closest synthetic form of thyroxine hormone to what a healthy thyroid gland produces. If the thyroid gland is underactive, your doctor will prescribe a small dose to start your treatment, usually 50 mcgs. and increase the dose as the thyroid gland becomes progressively inactive. If this medication is prescribed as a result of a total/hemi thyroidectomy, your treating doctor will determine the initial dose following surgery and after pathology tests. It is unusual for patients to cease this medication once it has begun, as thyroxine hormone is an essential hormone to regulate body function. Please note: Eltroxin is not the same formula as Oroxine and Eutroxsig. Recent research supports The ATF’s Recommendation to take Oroxine/Eutroxsig/Eltroxin first thing in the morning (as soon as your eyes are open) with a glass of water only, on an empty stomach. Wait at least 30 – 60 minutes after taking the dose before breakfast. Other medications, vitamins/minerals herbal medicines and supplements should not be taken at the same time to avoid interactions with Oroxine/Eutroxsig/Eltroxin. An interval of at least 4 hours after taking Oroxine/Eutroxsig/Eltroxin is recommended by Prof. Jim Stockigt before taking other medications. (Thyroid News No 7 Sept/Oct 2001). This is due to possible interactions and lower absorption. The longer you can leave taking other medications the better, as many medications, vitamins and supplements intact with Oroxine/Eutroxsig/Eltroxin. It is essential to refrigerate blister strips not yet in use of Oroxine and Eutroxsig between 2 – 8 Degrees Celcius (refrigerated temperature). The ATF recommend all blister strips be kept refrigerated at all times. Remove your blister(s) from the refrigerator in the morning to retrieve your dose. This is to safeguard against spoilage from room temperatures rising throughout the day, due to seasonal change, or room heating during colder months. Laboratory tests have shown that if not stored correctly, there is a reduction in potency of the active ingredient, thyroxine sodium. Eltroxin does not need to be refrigerated. Eltroxin should be kept at room temperature below 25 degrees celsius. Please note Eltroxin is not the same formula as Oroxine/Eutroxsig. The ATF do not recommend taking any vitamins, supplements or herbal extracts, unless you have been diagnosed by way of pathology testing of a definite deficiency and increasing additional nutrient through your daily food intake has not improved the deficiency. Example: If you have low iron levels and increasing your weekly intake of red meat has not improved your iron levels. Therefore your treating doctor has recommended a supplement to improve your intake. Many vitamins, supplements and herbal extracts interact with Levothyroxine and can cause Levothyroxine levels and absorption to be affected. If you do need to take a vitamin, supplement or herbal extract please be very cautious and leave many hours between taking your Levothyroxine dose and then the supplement to avoid any unnecessary problems. Do not store Oroxine/Eutroxsig or any other medicines in a bathroom or near a sink. Do not leave Oroxine/Eutroxsig in the car or on a window sill. 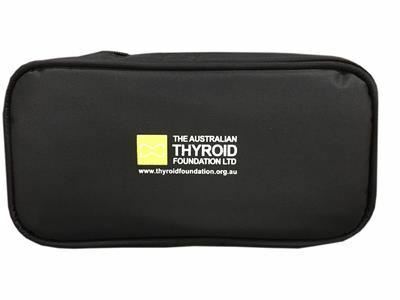 To ensure your medication stays cool and does not spoil from being exposed to heat whilst travelling, The ATF now has available as one of our many Member Services a Medication Travel Pack for members to purchase. The ATF is very pleased to announce, Aspen Pharmacare has provided sponsorship to allow The ATF to provide these much needed and requested Medication Travel Packs as a solution for ATF members to travel with their medication. The Medication Travel Pack is designed for transportation and cool storage of Oroxine and Eutroxsig. The ATF Medication Travel Pack is available to members of the ATF, as a Member Service. Join Today for thyroid one-on-one support, information and education. Once you're an ATF Member, login to your Membership Account to purchase a Medication Travel Pack. After receiving many concerns from ATF Members about keeping Oroxine and Eutroxsig cool whilst travelling, The ATF Committee resourced The ATF Medication Travel Pack to include as one of our Members Services, for members of the ATF to purchase as a solution to travelling with Oroxine and Eutroxsig.